This is going to be our third summer on the farm. Our flower gardens are finally looking like gardens, not just random plants stuck in a big expanse of dirt. Gardening takes work and it takes patience, but oh it pays off. It totally pays off. The ferns that I transplanted last year have all sprouted, we’re going to have a ton of peonies, and our irises are amazing. 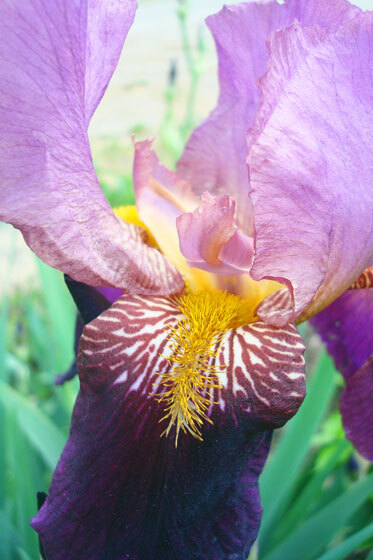 When I was growing up, my parents had some beautiful irises in their gardens: blue, peach and dark purple. 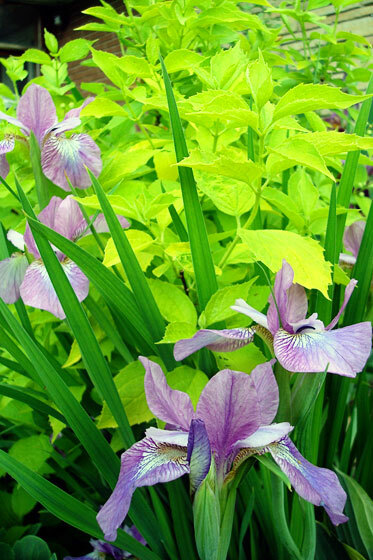 When I was setting up the gardens here at the farm my parents were taking out the last of their irises–the purple ones–and they gave me a bunch of plants. The stalks have taken root and they’re blooming prolifically. I love the frilly showy blossoms. Out on the turnaround, one particular plant has given us two-tone blossoms. Light purple on a couple of stalks and dark purple on the rest. I especially like the purple veins of the buds. You might recall that the farm came with a whole bunch of plants still in their nursery pots. Last year, I finally stuck them in the ground. This spring, I’ve discovered that some of them were miniature irises. They must be happy to be out of their pots because they’re blooming like crazy. I’ve been feeling like the gardens are finally established this year. Plants are filling out and blooming. I’m focused more on maintenance rather than actually building the gardens. 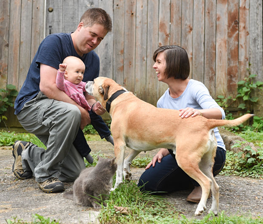 It’s nice to see the fruits–or the blooms–of my labour. How is your garden growing? 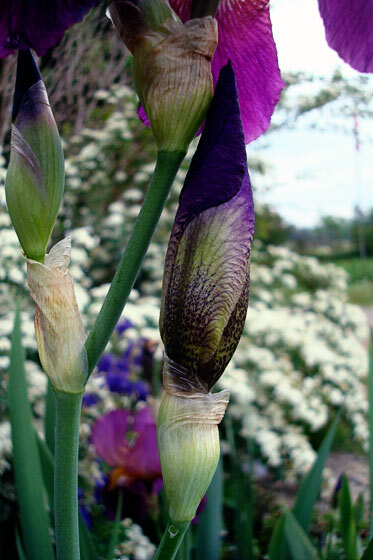 Do you have any irises at your house? What colour are they? Who else is an iris fan? 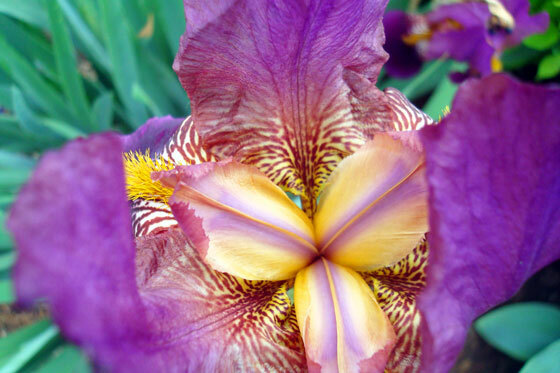 What’s blooming at your place? JUST GORGEOUS!! Would love pics. of peonies also . . . . GOOD JOB!! 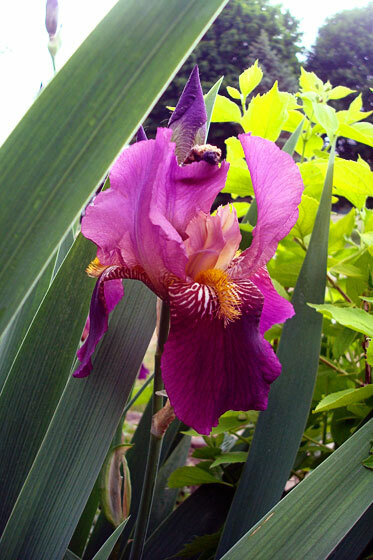 It’s special to discover what’s planted around a new-to-you house. Those water lilies sound wondeful. I think I’d have the exact same reaction as you! 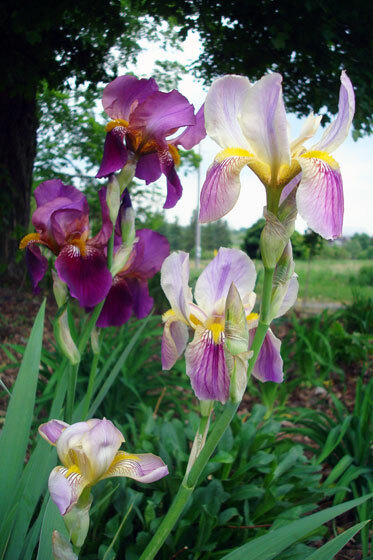 I have a small patch of Irises that I think needs thinned out and spread around the yard because they produce very few blooms. The few we had this year were a very pale yellow and they are at a place in the yard where I can’t see them from the house. I guess I have just added something to my to do list! You definitely should have them within view! (But sorry to add to your to-do list). Beautiful! I love the colours. I’m looking forward to more garden pix. Ours is looking the best ever this year, too. I’m really enjoying it! Yay for best ever garden year! Glad it’s not just me.